Cooper was an effective all-around back in college, rushing for 1583 yards on 407 carries and catching 101 passes for 802 yards. Altogether he totaled 2385 yards from scrimmage and 21 touchdowns. Attracted by his size and ability to catch the ball, he was chosen by the 49ers in the first round of the 1980 NFL draft (13th overall) and proved to be a productive receiver out of the backfield in Head Coach Bill Walsh’s West Coast offense. 49ers went 6-10 to finish third in the NFC West. 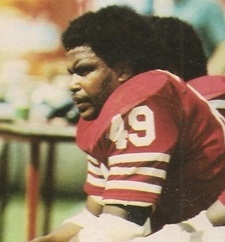 Cooper rushed for 330 yards on 98 carries and caught 51 passes for 477 yards during the 1981 season that ended with a win in the Super Bowl, where he also contributed a touchdown catch. However, he proved to not be an effective inside runner and lost his starting job during the strike-shortened 1982 season. Cooper was shifted to backup tight end in ’83 due to his pass receiving skills and had his best year at that position in 1984, with 41 catches for 459 yards and four TDs, but lasted just one more season in San Francisco and finished his career in 1986 with the Raiders. Overall, Cooper rushed for 1152 yards on 298 carries (3.9 avg.) and caught 213 passes for 1908 yards (9.0 avg. ), scoring a total of 18 touchdowns.